This water feature is typically incorporated in pairs or sets of three, though pool owners can choose to have as many as necessary for the desired audible and visual effect. This water feature may have taken a backseat in recent years to other new cutting edge options, but it is making strong comeback as geometric pools increase in desirability. The in-pool fountain brings an element of sophistication and opulence while still being an incredibly fun feature for kids and adults alike. Arguably the most complimentary water feature to the geometric pool given its matching crisp lines is the sheer descent waterfall. Unlike the typical bubbling rock waterfall which often accompanies freeform pools, the sheer descent provides a smooth cascade of water that continuously pours into the pool. Not only is it a visual delight, but many include this waterfall in their pool designs because of its therapeutic qualities. Looking for more ideas? 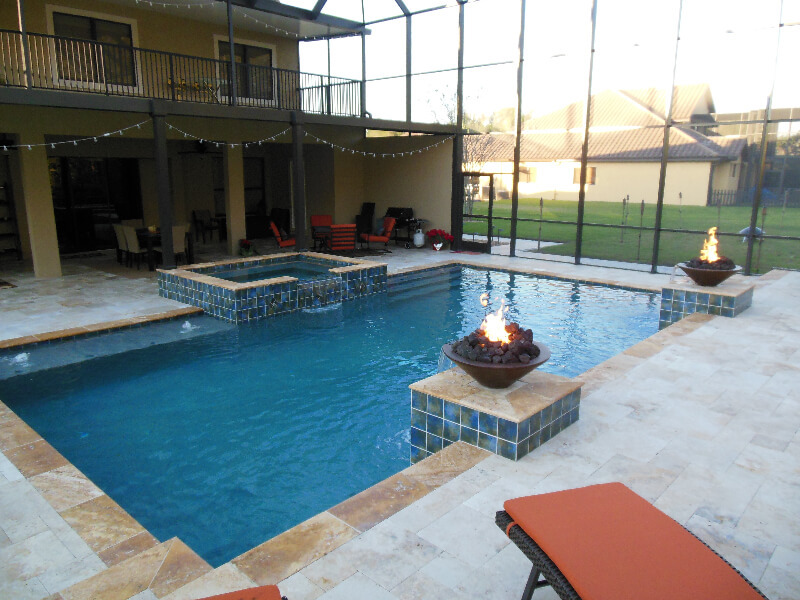 Take a look at our photo gallery for more inspiration on you next pool design project!